Welcome to our Veteran Services Webpage. We hope to provide you with useful information. If you would like to see other information on this page just let us know. We want this page to be your source for valuable Veteran information and we will be updating it often. Please join us on Facebook at Lincoln County Veterans Services. Our goal is to make as much information as possible readily available to you concerning all things Veteran. However always feel free to contact our office when you have any questions. Our goal is to be here for you and help you in any way we can. While there are ways to deal with the VA and file claims on your own, we strongly advise against that approach. Let us help you navigate the VA and file your claim for you. We can help improve your chances of success by making sure it is filed correctly and with the evidence needed for the VA to make an accurate and timely decision. Do not hesitate to contact us. We work for you and can and will help you no matter the issue. Contact us at 704-736-8506 or just stop by. We will do our best to see you quickly and provide the best and friendliest service possible. We are here for you. 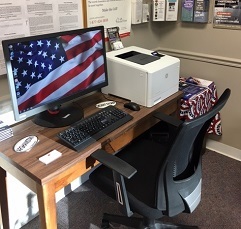 The Lincoln County Veterans Service Office assists veterans and their dependents in filing claims with the Veterans Administration for benefits and services. We are proud to announce our new "Information/Work Center". Please feel free to come in and use our new up-to-date technology. Maybe you just need to print off a form or search for a job. This is your place to do so. Does the VA pay for cremation or burial expenses? How do I enroll in VA Health Care? How do I obtain a DD-214?